The "Best Yet" Supermarket in the 37th Street Plaza in Astoria used to be a classic old red and yellow Shop Rite, famous in the neighborhood, where we all used to graze in the candy section and wait outside to see if anybody would pay 50¢ for helping them bring their groceries to the car. 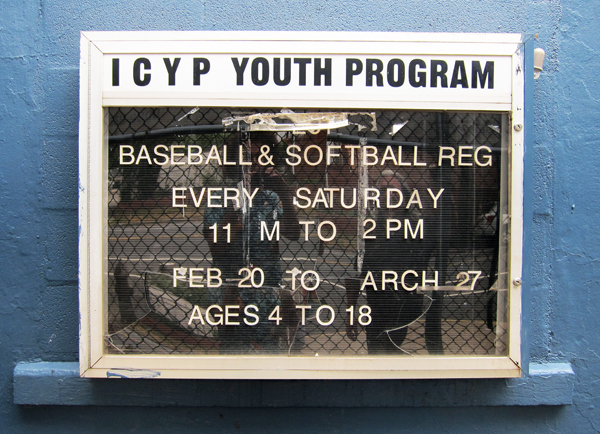 In conjunction with the local church (Immaculate Conception), our Shop-Rite used to be a huge sponsor of the ICYP little league program. The fields that housed the six baseball diamonds that comprised the league were sandwiched between the Shop Rite parking lot and the endless stretch of generators that make up Con Ed's Queens facility which end at the East River. 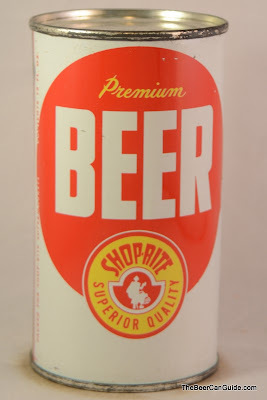 But in addition to the little league, our Shop-Rite used to run an adult league, comprised of teams from other supermarkets that went as far east as Long Island. All the supermarkets played: Met Food, Scaturros, Key Food, the A&P, Grand Union, Waldbaums, Pioneer, C-Town, even the Associated from up on Ditmars whose team was full of old rock-n-roll burn-outs. Mostly, the teams were made up of old-timers, young deli-counter-types, check-out girls, and teenage stockroom kids. They battled it out for the rest of the summer while the little league championships ended in early July. The Supermarket teams played into September, trying to mimic the scheduling of the majors. 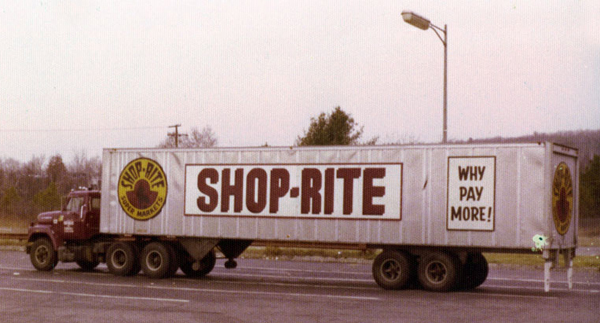 My cousin Stevie, a Trans-Am driving guido of mostly ill repute, was on the Shop Rite team when I was still in grammar school. Sometimes he or my dad would take me to the games - which seemed more like 23-inning keggers. Someone was always carting in another keg. The players were all drunk, and there were tons of fights -- but they ran a killer snack-bar/souvlaki stand and all the kids that didn't get shipped off to summer camp traded comics and baseball cards in the equipment shed. The shed was a rusted out old shipping container that had dirty pictures glued all over the walls, and was supposedly where Mavroulis the "groundskeeper" lived. There was a busted up old cot in there, but everybody knew that was where older kids would take girls to talk about homework. Still, if you met Mavroulis, you'd believe that he lived there. Mavroulis was Greek, but my dad and Stevie called him Marvin, and most of the kids called him Martian. He used to spray us with the garden hose all the time. My Dad said he took too many diet pills. Where is this post going? 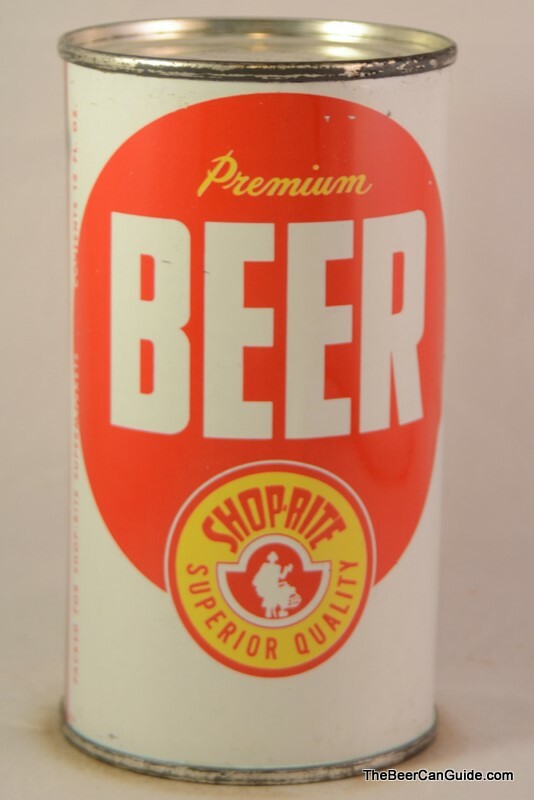 Well, the most interesting thing about the Shop-Rite Supermarket league was that Sal, the son of Shop-Rite's owner, my cousin Stevie's good friend, used to throw these big Saturday Night dance parties, in honor of all wins AND losses. He threw these parties IN THE SUPERMARKET. Stevie said they would go crazy and drink all the beer they wanted and play bumper cars with the shopping carts all night. It became like a thing. The party in the supermarket. The parking lot would be packed with Trans-Ams, Corvettes, and Camaros (it was around the time that the Irock-Z hit). You couldn't get into the place. I knew a gy named Dmitri who said he worked the party as a valet. You'd have to go in the back and they had bouncers and velvet ropes and everything. This was like 1982. They'd DJ over the PA system and open as many bags of potato chips as they wanted. Stevie said Grandmaster Flash was even supposed to DJ there once, but he never showed. 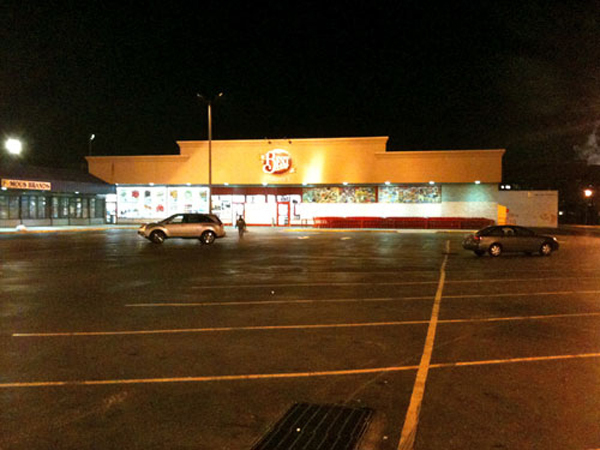 This is the parking lot now, not filled with any awesome guido cars at all. Before I was in junior high, the police raided the joint, and Sal's dad shut down the party scene for good. In a few months the Shop-Rite became a Waldbaums. 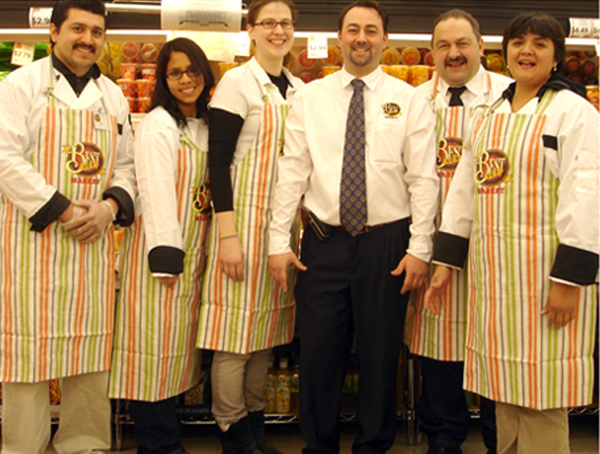 This was after the Shop-Rite team had enjoyed a disaster of a season and lost to everybody. Even still, my cousin told me that the reason the party got raided was because the Met Food team was jealous of the Shop-Rite guys having all the fun and ratted them out to the cops. There were so many fines that the only thing Sal's family could do was sell. The other day George, the guy who plays Mr. Parfenix, and I, were walking around Astoria and we happened upon the old supermarket, which, as I said before, is now a Best Yet. 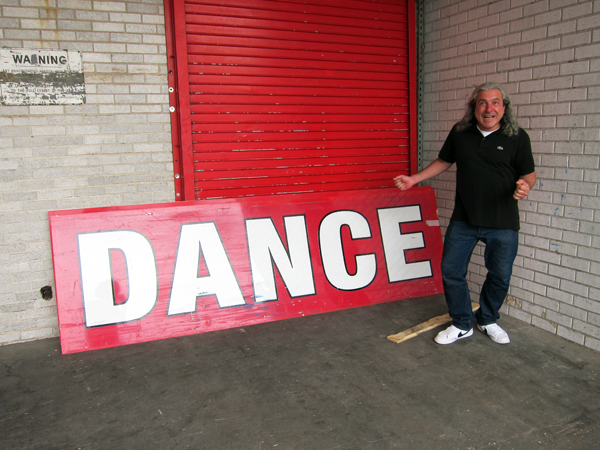 We went around back, and lo and behold - there was this huge DANCE sign sitting back there. Which made me think of this story. Could the Best Yet guys be up to the same old tricks? 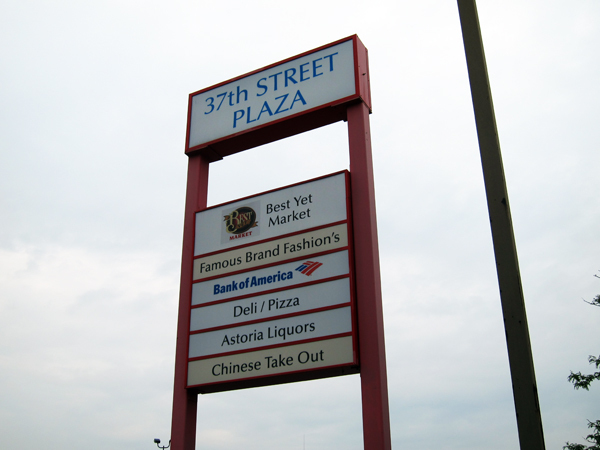 Is there an awesome dance party going on in the back of 37th Street Plaza on Saturday Nights? You be the judge.